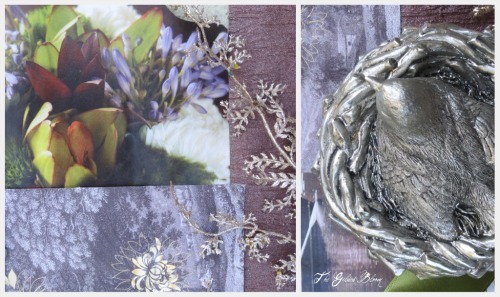 This mood board, created for Blogging Your Way class taught by Holly Becker and Leslie Shewring, focuses on the timeless romantic aspect of nature that is currently inspiring my art. The silver bird and glittering branches catch the light and draw the eye to a collage of lavender, chartreuse and burgundy flowers. The tree etching, found on a soap wrapper, recalls the style of Romantic landscape painting and is printed in purple ink with gold accents. A quiet day on the water, surrounded by nature's sublime beauty is captured in the catalog photo on the left, encircled by a chartreuse ribbon. 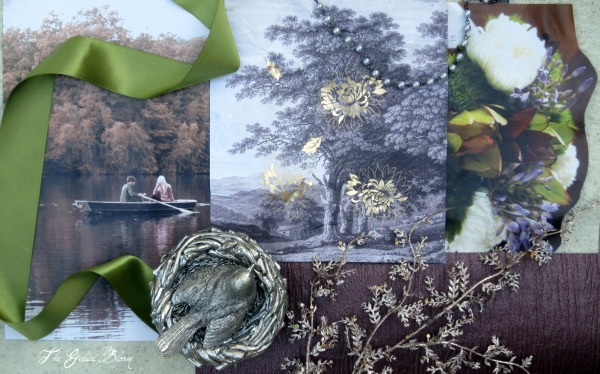 The rich tones of green and aubergine in this autumn mood board evoke a serene but earthy quality.